Engineers working on the Forth Road Bridge have revealed how they plan to fix the section which cracked forcing the road to close until the new year. It involves a "plate welded repair" around the truss which failed. An access platform is being built around the broken section which is in a part of the bridge which is difficult to reach. First Minister Nicola Sturgeon told MSPs that the "absolute intention" was to reopen the bridge to all vehicles. Operator Amey also said it still hoped to have the bridge open again by the end of the month. The temporary repair will involve the shear truss end having metal splints attached to either side of it. The platform will permit teams of welders to work day and night, when weather conditions allow. Mark Arndt, Amey's account director responsible for the bridge, said: "Our teams have been working 24/7 since the defect was identified a little over a week ago. "Our design teams have finalised the detailed solution plan, the access platform is under construction and we've mobilised all the resources we need to begin the repair works." However, he added: "Progress of the repair work is vulnerable to weather conditions. "Wind speeds at times make it unsafe for our people to continue, but by having our personnel on standby at the bridge and by monitoring live wind-speed data in our control room we're able to get straight back out to work on the repairs in every available window and our programme remains on schedule for completion in the new year. "In addition to repairing the defect, Amey is taking preventative action on another seven similar locations on the bridge to prevent any issues from occurring. Structural monitoring systems are also being installed at these locations. The bridge repairs and controversy over maintenance work in recent years were the subject of a heated debate at first minister's questions. After Conservative leader Ruth Davidson called for a guarantee that the bridge would reopen to all vehicles, Ms Sturgeon said that was the government's "absolute intention". She said: "The absolute intention of this government is to have the bridge open for people returning to work in the new year, and for that to be a case of the bridge being open as normal, to all vehicles that previously travelled over the bridge. 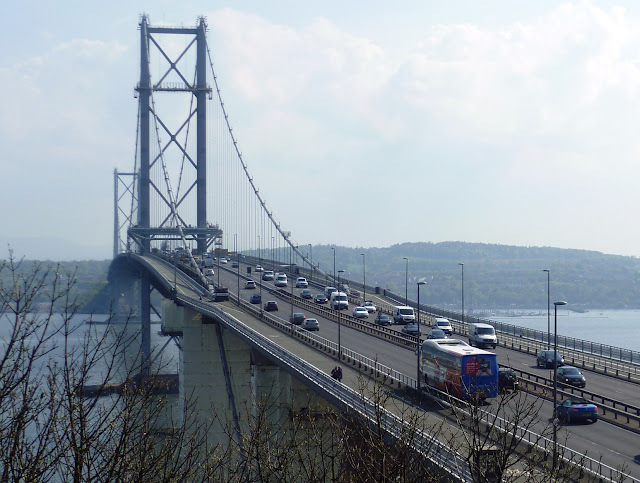 "Particularly at this time of year, work to a structure like the Forth Road Bridge is heavily weather-dependent, but when I last spoke to the senior engineer yesterday the update I was given was that it was on track. We are closely monitoring the situation." Labour leader Kezia Dugdale criticised the government for "putting off essential work in hope of saving some money", saying maintenance budgets had been "slashed" by 65%. She produced minutes from the old Forth Estuary Transport Authority which showed reductions in capital spending following the Scottish government's 2013 spending review, causing projects including work to the truss-end links, now damaged, to be deferred. She said: "That key work was delayed because of SNP government cuts. Short-term decisions made at the expense of the long-term future of an important national asset. Instead of constantly trying to avoid the blame, when will this government accept some responsibility?" Ms Sturgeon hit back, saying the Scottish government could not be criticised for "penny-pinching" when it had taken forward the new £1.4bn Queensferry Crossing. "This is the government that decided to invest in a new Forth replacement crossing - hardly the hallmark of a government that was trying to save money," she said. The first minister also underlined that the area where the crack in the bridge had appeared was not in need of repair in 2010, saying the government had not had "a crystal ball" five years ago. She added: "Can I state the absolute determination of me and this government to do everything that we possibly can to minimise disruption, and even more importantly to get the Forth Road Bridge open again as quickly as possible."